Takeaway: An improved communication system between corrosion engineers and managers based on Corrosion Knowledge Management (CKM) principles can help reduce the cost and consequences of existing and future corrosion problems. This article with co-authored by Farzaneh Akvan Corrosion Department, Faranegarzarfam Company, Tehran, Iran. Corrosion management (CM) is a relatively well-known term to address technicalities involved in the prevention and mitigation of corrosion. 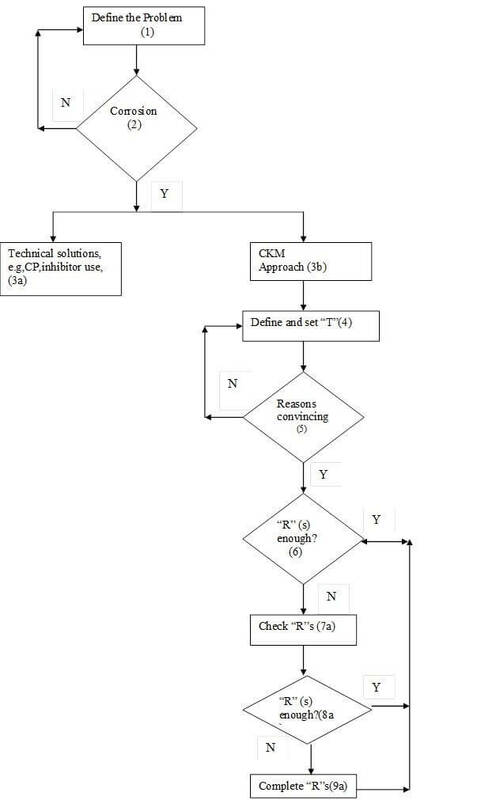 It is proposed that based on this model for dealing with corrosion, a better understanding of corrosion and its seriousness is created and that via a feasible communication system based on CKM principles can help reduce the cost and consequences of both existing and future corrosion problems. The approach of corrosion management (CM) to the problem of corrosion is a set of techniques that are applied to prevent or mitigate corrosion. CM techniques are limited to application of cathodic protection or anodic protection, use of inhibitor or biocide material selection, coating/lining application and so on. Despite having rather different applications and principles, what is common among all the CM techniques is that, with the exception of a limited group of corrosion technologists, the literature and the associated language sound like jargon to non-corrosionists. Even a corrosionist who has been dealing with cathodic protection would behave quite carefully. The degree of conservativeness increases when this CP specialist deals with coating application or biocide selection. The very existence of this “Babylon Tower” may sound like yesterday’s news given that each discipline uses its own terminology and nomenclature. When it comes to corrosion, this lack of communication must be improved. Corrosion science and technology is in essence different from all other disciplines of science and engineering in that while corrosion deals with degradation and failure mechanisms, all other branches of science and technology consider new technologies for manufacturing and production. Therefore, any non-corrosionist who is dealing with using materials must consider their service life based not only on assumptions and expectations but on real conditions of service. Metallic loss, wear and tear, and depreciation are handicapped references to what corrosion is and can become. Routine financial formats, in which a certain rate of physical depreciation is taken, are based on assumptions that under real life conditions may not always be met. To get a more realistic understanding about financial risks associated with corrosion, a more active and feasible dialogue between corrosionists and non-corrosionists is quite necessary. Multi-dimensional features of corrosion disasters are reflected in their serious impacts on a range of factors such as environmental, economic and community health. Some examples of such impacts of corrosion are given later in this paper. In this regard, caring about corrosion becomes everybody’s job, like first aid or safe driving. They are not the responsibility of only a few. The lack of communication between corrosionists and non-corrosionists not only increases labor and expenses in many cases, but also results in environmental changes (impacts) on both nature and society. In particular, if the non-corrosionists are managers who have had no official training in engineering and especially in corrosion engineering, then the lack of communication becomes even more important. Figure 1 schematically shows the impact. Figure 1. 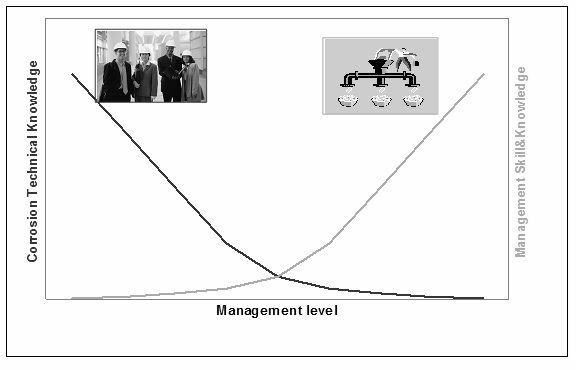 The bright line shows that as management levels increase, the technical knowledge is likely not to follow. The dark line shows that it may be the low echelon engineer who can lecture about the technicalities of corrosion and not necessarily the CEO. 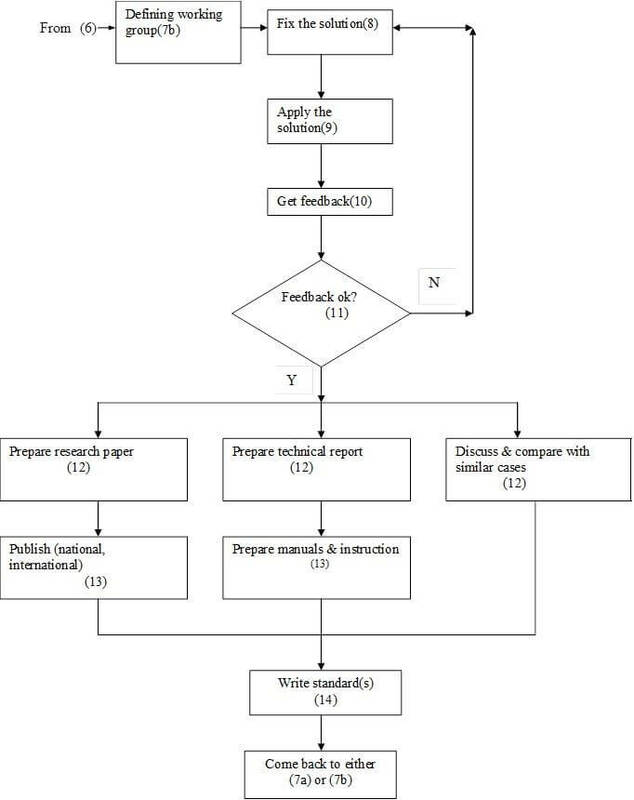 The purpose of this paper is to present a model for material management called “Corrosion Knowledge Management” that may be applied by both corrosion experts and non-corrosionists to evaluate the impacts and effects of corrosion. The methodology can also offer a way to overcome the environmental impacts of corrosion. Corrosion according to the ISO 8044 standard is defined as “physicochemical interaction (usually of an electrochemical nature) between a metal and its environment which results in changes in the properties of the metal and which may often lead to impairment of the function of the metal, the environment, or the technical system of which these form a part." Corrosion can be mitigated by two main methods. One method, that we call the technical approach, includes almost all known techniques towards corrosion mitigation such as applying cathodic protection, using inhibitors/biocides, etc. The other method, that we call corrosion management, enjoys a less technical but more managerial approach to corrosion. In this paper, the technical approach will not be discussed. Instead we will mainly focus on corrosion management and its principles, as it is a powerful tool for corrosion experts as well as non-corrosionists to deal with corrosion. Nowadays, there is a tremendous trend towards the belief that managers must not necessarily have an expertise about the industry in which they are acting. Now it is common to find an engineer - who hasn’t taken any particular course of study on corrosion - acting as the corrosion expert in industrial units. Such managers are highly dependent on reports prepared by their colleagues and staffs, according to a pre-defined hierarchy. In fact, what happens most of the time is that they receive reports indicating that there is a problem somewhere, and that problem appears to be of such and such nature. These reports, which are routine everywhere in industry, usually just describe the existence of a problem but they do not give any particular idea about the type of problem or specific cause(s) of the problem. A common feature of such reports is that they are almost always asking the manager to decide. It is left to the manager to sign a purchase order for buying this or that required chemical, to approve a research project or to invite experts from the outside. However, how does a manager recognize the severity of a problem that may be beyond his own expertise, experience or even interest? How is he supposed to allocate his resources in the best way to mitigate a corrosion problem while trying to lower costs? For a manager without a deep technical knowledge about corrosion, it is almost impossible to make these technical decisions. On the other hand, real life conditions are unsuitable for those with a deep knowledge of corrosion to be the decision maker. So, what must be done? This section will very briefly describe some tools by which managers, without hands-on experience in corrosion, may become confident about the best strategy to take against corrosion. Managers will be advised to organize their resources in a more feasible way to mitigate corrosion through CM. Using CM principles in the petroleum industry in some countries has extended their system’s service life and resulted in savings, in net present value terms, of several million dollars. CM may be defined as the fastest, least expensive way to control corrosion in terms of resource management. Why did I choose these targets? How should I achieve the targets using the resources? Knowledge in this context means the minimum requirements one has about a subject area; in other words, it specifically means at least an academic degree. When someone earns his or her degree in engineering or a similar discipline, their knowledge gives them the ability to both define and predict the state of a system. Although necessary, having knowledge is not enough. Holding an academic degree means that through academic training, one supposedly understands the basic facts of a scientific discipline, but this doesn’t necessarily mean that they have the ability to distinguish, among other things, what type of solution is the best one for a given problem. One has to update knowledge. The continuous process of renewal and updating knowledge is gaining information. So for a manager, as far as their duties as a manager are concerned, gaining information means a continuous process of being aware of everything related to their specific job. A manager of a museum with a B.Sc. in mechanical engineering would definitely have to study more about their particular job and its new developments than would an individual with a degree in art. The same is true when an engineer becomes a manager of an industrial unit, as he knows that corrosion will be an important factor in his work, but without knowing how he can re-orient his resources for finding a holistic approach against corrosion, he will always be handling corrosion as cases separated from each other in space and time. Any processed data entering our knowledge territory to improve it according to existing conditions is called information. To truly know the resources, a good manager must have both knowledge and information about the resources. It must be said that of the three principles mentioned above, the first activity is the one that makes a project feasible. The other two factors are mechanically calculated according to the complexity of the project in terms of the factors involved. We will see the importance of knowing the elements of a project when we introduce the concepts of corrosion of system and corrosion in system. Corrosion Knowledge Management (CKM) in essence doesn’t differ from other management approaches. CM requires one to consider R, T and P as well as answering the 2WH questions to decrease the unwanted effects of corrosion. CKM in fact summarizes what industry can eventually end up with in a more ordered, systematic way, so it is possible to find cases where industry is already using CM without necessarily naming it. The above simply means that to combat corrosion and decrease its costs, managers must re-consider their R and T according to the principles of Corrosion Knowledge Management. In other words, if they see there is a corrosion problem in their systems, first they have to check their resources to confirm that they are all there. They must see if they have facilities for doing research on corrosion-resistant materials and/or new methods for controlling that type of corrosion. It should be noted, however, that setting targets (the why question of 2WH questions) will determine which factor is missing in resources or which factor is worthy of more timely consideration. Why Should We Care About Corrosion? In the 2WH questions, we now know what our resources are for combating corrosion, i.e., we know R in CKM. We also know how we should reach our target, i.e., we know that to decrease corrosion costs we must apply CKM principles. Just one question remains: why should we fight against corrosion? Although it may seem evident why we should try to lower corrosion costs, this section is devoted to finding an answer to this question. Approximately 50% of every ton of steel from worldwide production is required to replace rusted steel. Reports show that the loss of a Sea Harrier jet in the Adriatic in December 1994 and partial structural loss in a 19 year-old Aloha Airlines Boeing 737 in April 1988 can both be attributed to corrosion. Insurance companies paid out more than US $91 billion in losses from weather-related natural disasters in the 1990s, whereas the direct loss from corrosion in the United States industry in 1994 alone was US $300 billion. From many studies the cost of corrosion is reported to be on the order of 4% of the Gross National Product (GNP) of any industrialized country. For instance, using the GNP of Australia in 1999, one can estimate a minimum loss due to corrosion for Australia’s industry to be around US $15 billion per year. British Petroleum (BP) reported that the cost of corrosion is equivalent to 6% of the company’s net asset value. In the power industry, it was estimated that corrosion losses in utility steam systems amounted to about US $1.5 billion of the US $70 billion annual cost of corrosion in the US in 1978. Table 1 shows some examples of recorded environmental/health impacts of corrosion in different years, countries and locations. Table 1. Selected examples of damages caused by corrosion. Sinking of River Queen ship. Pitting corrosion of the ship’s bottom. Huge life and material loss. Collapse of the 200-ton concrete ceiling of an indoor swimming pool. SCC in stainless steel bars holding the ceiling, due to existing chlorine ions. 12 people died, some others injured. Petrol leaking from a valve on a 1,300 m3 storage tank caught fire, causing the tank to explode. Four people died and 16 injured. The Red Cross tended to 960 people and 10,000 were evacuated. It took two days to bring the fire under control. Spill of over 35,000 liters of oil in one night. A leak in a damaged pipeline owned by Mobil Oil. Leakage of over 1,200 tons of oil. Leakage from a ruptured pipeline. About 400 tons of oil spilled into the River Volga. A dam was built in a tributary of the river to prevent further pollution. So a project whose goal is to solve all corrosion problems of a car would have to deal with all of the corrosion problems in all subsystems. In other words, it would be a COFS approach. In this case, study of the corrosion of just a given subsystem, such as Corr(C), would be a CINS approach. It is so important to distinguish between CINS and COFS approaches, otherwise many problems concerning the expected time span of the project or required capital for doing the project may arise. A very important point is that, in practice, it is better to define a corrosion system, by a corrosion expert, as the system with “highest risk.” More often than not, a large percentage of the risk (> 80%) is found to be associated with a small percentage of the equipment (< 20%). Once identified, the higher-risk equipment becomes the focus of inspection and maintenance to reduce the risk, while opportunities may be found to reduce inspection and maintenance of the lower-risk equipment without significantly increasing risk. In other words, to be on the safe side it is better to choose the system of concern to be the one with a higher risk and define COFS and CINS according to real working conditions of the system. Schematically, CKM is represented as in Figure 2. Figure 2. How resources can be used through CKM to achieve reduction of unwanted effects and impacts of corrosion. Each phase is shown by numbers in parenthesis, so step (2) comes after step (1), step (10) is followed by step (11) and so on. Phases, such as (3a) and (3b), just show that both activities can be taken simultaneously or, depending on the severity of the existing problem, can be taken separately. So, if a manager sees that there is a corrosion problem, they can have it solved by both technical solutions and a managerial approach. Depending upon conditions, however, this manager may decide just to follow the traditional technical solutions and not a CM approach. On the other hand, (7a) and (7b) show that if Rs are insufficient, the path (7a) through (9a) must be followed until we are sure about our resources. However, if we are already sure about them, we can just follow the path starting with (7b) and continue on. After (14), it may appear that a loop has been formed. In fact, after coming to that stage our information about our resources has been upgraded. This means that when we have come to the point that we are able to write standards out of our experiments, our information about a certain case has been advanced. Bearing these in mind, by coming back to (7a) or (7b), we are building up our new information on higher ground so that in a 3-dimensional viewpoint instead of having a circular loop movement, we would have a helical advancement upward every time. Figure 3. Flowchart for applying CKM to a system. We need to borrow two terms from ISO 14000 terminologies: namely, environmental aspect and environmental impact. In simple terms, environmental aspect is all parts of the activities, functions, products or services of an organization (e.g., factory, plant) that are capable of interacting with the environment, whereas environmental impact is any change in the environment, useful or harmful, that may have resulted, partly or generally, from activities, products or services of an organization. For example, the dust resulting from industrial activities such as sand blasting is an example of environmental aspect whereas the problems it causes on health is its environmental impact. According to ISO 14000 procedures, one should always consider the most dangerous impact as it is not practical to investigate and control all environmental impacts. In this way, ISO 14000 resembles CM where “a corrosion system, by a corrosion expert, is defined as the system with highest risk.” So, when considering environmental impacts, one should not only take care of the most dangerous impact from an environmental point of view, but also consider the impact that is at the highest risk of corrosion. What is meant by direct environmental impacts of corrosion are those impacts that resulted just because of corrosion; leakage of dangerous liquids or gases due to weld decay or stress corrosion cracking (SCC) are examples. On the other hand, indirect environmental impacts of corrosion are those impacts where, at first glance, corrosion does not seem to be the main cause. An example of this sort could be energy waste in a car due to a malfunction that could have been the result of corrosion. To study the above three items, the environmental expert has to work with a corrosion expert to define the system (corrosion system) and the corrosion type. It is even possible that the corrosion expert will be able to define the domain in which the environmental impact of that type of corrosion will occur. An example is the study of atmospheric corrosion in industrial areas compared to atmospheric corrosion in tropical areas. Another difference is that the domain of the indirect environmental impacts of corrosion can be broader than that of the direct environmental impacts. The main reason is that the factors contributing to the environmental impacts of corrosion are not limited to corrosion alone and there may be many other contributing factors. For instance, when considering the environmental impacts of corrosion due to the failure of a pipeline, the quality of welding and post-welding processes, the soil around the pipeline (if buried), the quality of coatings and linings, the location’s topography, the type of fertilizers used nearby (to see if a certain type of corrosion called microbiological corrosion can be stimulated) and things of this sort may be important. The domain of the environmental impacts of corrosion is so broad that the environmental analyst would not only need the help of a corrosion expert but also an energy auditor to help build the picture in its most comprehensive way. Preserving and managing the environment in terms of energy and materials resources is very important to developed countries. Although methods for energy management have been developed, no method is available yet to manage material. CKM can be regarded as a method to mitigate corrosion and therefore minimize material loss. Principles of CKM can be employed by both corrosion experts and by non-corrosionists (especially managers with little or no background in corrosion) to find the most suitable method for resource management. By considering the corrosion type as an environmental aspect and its result on the environment as an impact, one can distinguish between two types of environmental impacts of corrosion: direct and indirect. Both types of impacts have the same details (defining the corrosion system, defining environmental aspect or corrosion type and defining and determining the corrosion impact on the environment and its domain). Due to the multi-dimensional nature of the impacts of corrosion on the environment, a multi-disciplinary team containing experts in corrosion and energy auditing must help the environmental expert to define the environmental aspects and impacts of a corrosion system clearly and thoroughly. 1. E. Mattson, “Basic Corrosion Technology for Scientists and Engineers”, Chp.3, Ellis Horwood Publishers, 1989. 2. W.M. Cox, “Integrated Management of Plant Equipment”, presented as technical lecture about corrosion at Iranian Petrochemical industry, 1996. 3. P.A. Attwood, K.K. Bool, A. Feng, H. Mohideen, “The Development of a Corrosion Management System as a Means of Achieving Cost Control in Oil Production Operations”, 7th Middle East Corrosion Conference, Proceedings, Vol.2, paper, F-01, NACE-Bahrain Society of Engineers, Bahrain, 1996. 4. H.H. Uhlig, “Corrosion and Corrosion Control”, 2nd edition, John Wiley & Sons. Inc., 1971. 5. “New Prefabricated Joist Designs Researched”, Materials Performance (MP), Vol.36, No.7, July 1997. 6. K.W.M. Hill, “Corrosion Prevention in the Royal Air Force: There is No Option”, No.26, Corrosion Management, November/December 1998. 7.Worldwatch News Brief 99-3, “Destructive Storms Drive Insurance Losses Up”, www.worldwatch.ord, March 26, 1999. 8. “Cost of Corrosion: $300 Billion a Year”, Materials Performance (MP), Vol.34, No.6, June 1995. 9. E. Heitz, “A Working Party Report on Microbiological Degradation of Materials and Methods of Protection”, eds. E. Heitz, A.D. Mercer, W. Sand, A.K. Tiller, Pub: The Institute of Materials, England, 1992, p.31. 10. R. Javaherdashti, R.K. Singh Raman, “Microbiologically-Influenced Corrosion of Stainless Steels in Marine Environments with Sulphur-Reducing and Iron Bacteria: An Overview”, Proceedings of Engineering Materials 2001, Australia, Melbourne, September 23-26, 2001. 11. G. Gaona-Tiburcio et al., “Stress Corrosion Cracking Behaviour of Precipitation Hardened Stainless Steels in High Purity Water Environments”, Anti-Corrosion Methods & Materials, Vol.48, No.1, 2001. 12. “Update on U.S. Corrosion Cost Study”, Materials Performance (MP), Vol.39, No.3, 2000. 13. “Bacteria Could Help Control Corrosion at Power Plants”, Materials Performance (MP), Vol.37, No.11, 1998. 14. “Cost of Corrosion Study Update: Trends in the Automotive Industry”, Materials Performance (MP), Vol.39, No.8, 2000. 15. R. Javaherdashti, “How Corrosion Affects Industry and Life?” Anti-Corrosion Methods & Materials, Vol.47, No.1, 2000. 16. “Industrial Accidents”, UNEP Industry and Environment, Vol.20, No.3, July-September 1997. 17. R. Javaherdashti, “Corrosion Management: CM”, www.nrcan.gc.ca/picon/conference2; Natural Resources Canada, December 18, 2000. 18. D. Milliams, K. Van Gelder, “Corrosion Management”, Materials Performance (MP), Vol.35, No.11, November 1996. 19. “Corrosion in Automotives” in “Corrosion Tests and Standards Manual: Application and Interpretation”, R. Baboian, Ed., ASTM manual series: MNL 20, ASTM, 1995. 20. R.J. Hovarth, “The Role of the Corrosion Engineer in the Development and Application of Risk-Based Inspection for Plant Equipment, Vol.37, No.7, July 1998. 21. R. Javaherdashti, “How to Manage Corrosion Control without a Corrosion Background”, Materials Performance (MP), Vol.41, No.3, March 2002, USA. 22. R. Javaherdashti, “Managing Corrosion by Corrosion Management: A Guide for Industry Managers”, Corrosion Reviews, Vol.21, No.4, 2003.